The Boy Name of the Week has both mythical and celestial associations to it. Orion is the name of a constellation of stars. Most visible to the naked eye is a line of three stars that form Orion's belt. The constellation was named after a legendary Greek hunter who is said to have been killed by a scorpion that was sent by Gaia. 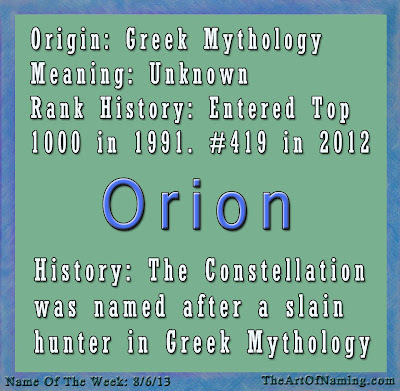 However, here are many different tales about Orion and his origins in mythology. 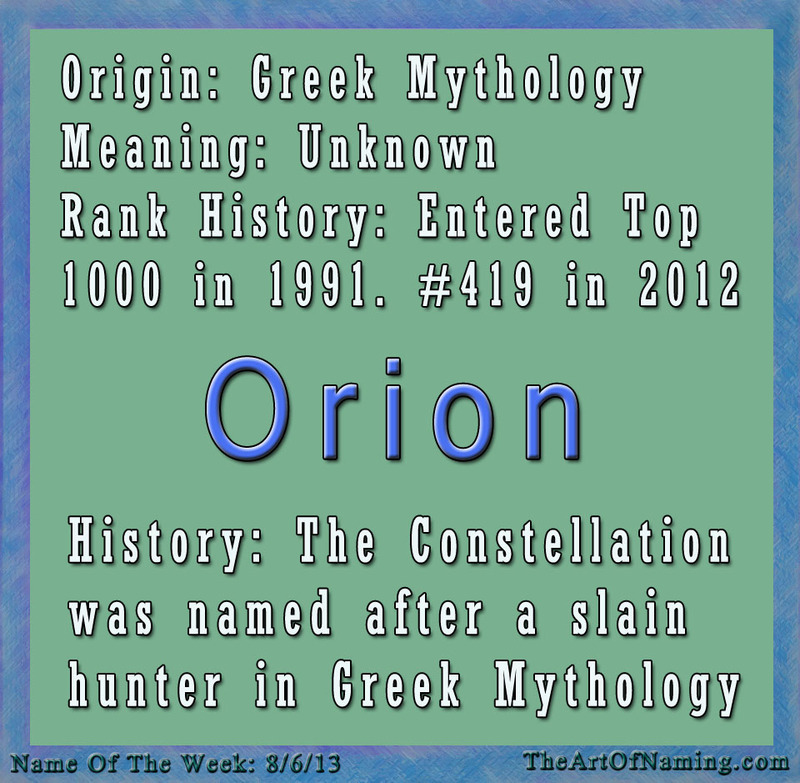 The name Orion does not have a known meaning, but could be related to the Greek ‘οριον' (horion) which means "boundary" or "limit". Orion has ranked in the US since 1880 but it was extremely rare and hardly used until it began gaining a bit of momentum in the 70s. It landed on the top 1000 chart for the first time in 1991 at #995 then fell back off for two years. Starting in 1994, this name has been on an upward trajectory! 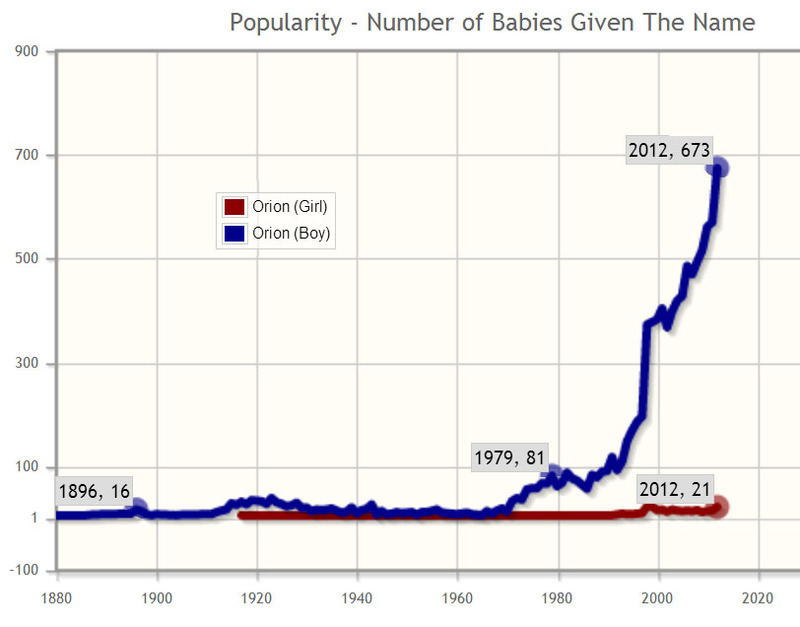 In 2012, there were 673 baby boys named Orion which ranked the name at #419. There were also 21 female births in 2012. There has been a handful of girls given this name since 1991 (and 5 random births in 1917) but this is an overwhelmingly male name. This name is categorized with nature names and celestial names as well as mythological names. I'm featuring it as my favorite name from yesterday's Nature Names post. I would probably pair Orion with a traditional name like Orion James or Matthew Orion since it is a bold choice. 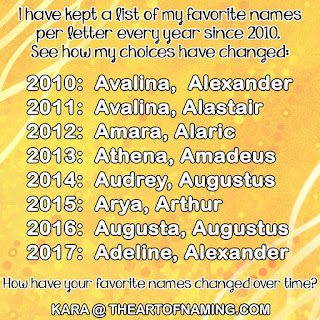 What do you think of this name?